University Council member Mark McKee. 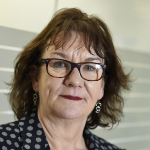 Mary McKee developed and leads on the newly established Strategic Support Unit within the Strategic Investment Board, as well as pioneering the Buy Social programme making social clauses mandatory across government construction contracts over £2 million and civil engineering contracts over £4 million. She has been a non executive member of a number of Boards including the Probation Board and an independent member of the Northern Ireland Policing Board. Mary led on the development of a Peace building Conflict Centre at the former prison site Maze Long Kesh. Mary holds a Bachelor of Science in Social Policy Master of Science in Policy & Administration ILM Leadership & Management Diploma in Executive Coaching Tavistock London.